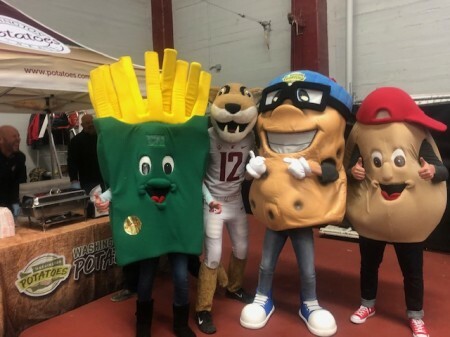 WSPC Commissioners and staff members had a blast, serving FREE baked potatoes in the Field House at the 2018 Apple Cup! The hungry crowds loved our product and were able to head over to the game with warm full bellies on the snowy evening. Over 1,700 baked potatoes to the excited game-goers. While collecting their free baked potatoes, fans also had the opportunity to donate to Second Harvest Food Bank. We were able to raise funds from generous fans to donate to 2nd Harvest to help feed those in need this holiday season. There was a lot of excitement in Pullman last Friday, and many people were able to make new friends. Even our potato pal Russ was able to meet Butch, the WSU mascot at the game. We hope everyone had as much fun as we did at this energetic event!